In compressible flow, exact relation between pressure and specific volume is required, but it is not easily determined in each specific problem. Usually extremes are considered like adiabatic and isothermal flow. Calculator for pressure drop due to minor losses and friction for for known flow rate in a pipe. 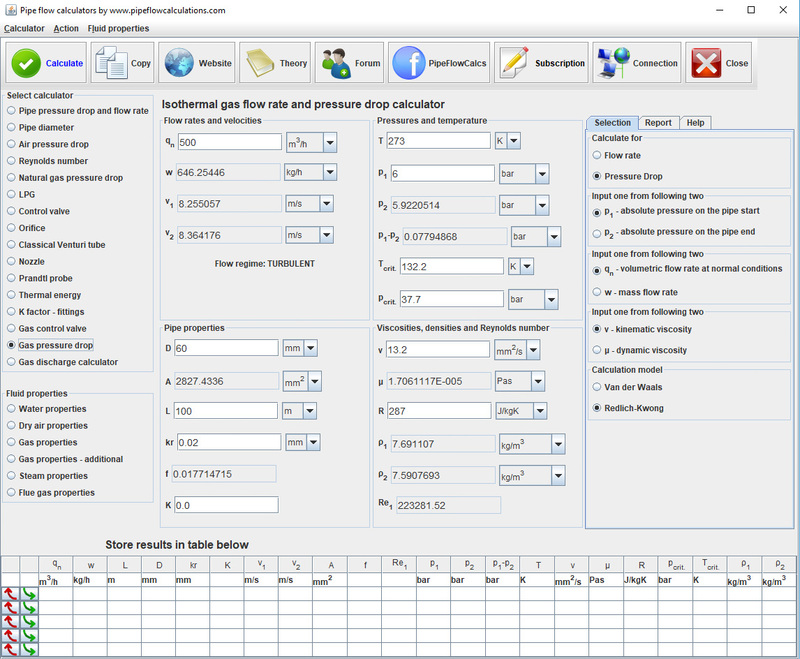 Calculate flow rate for known pressure drop in a pipe. Calculate flow velocities on the start and on the end of pipe. Friction factor calculation. Isothermal compressible flow is the flow at constant temperature. Isothermal compressible flow often more closer to fact in piping transportation systems like in natural gas lines. Other relation between pressure and specific volume are called polytrophic and interpretation for each individual case is almost impossible. For pressure drops higher than 40% of inlet pressure, as in long pipe lines, other formulas should be used. Calculate air pressure drop, flow rate, velocities, friction factor of air in closed round pipe. Acceleration can be neglected because the pipe line is long. Friction factor used in Weymouth formula is: f=0.094/d 1/3. This friction factor is identical with one obtained from Moody diagram for fully turbulent flow for 20 inch inside diameter. For pipe diameters that are smaller than 20 inch, Weymouth friction factors are larger and for pipes bigger than 20 inch, Weymouth friction factor is smaller than in friction factors obtained from Moody diagram for same pipe sizes. Panhandle formula is for natural gas pipe sizes from 6" to 24", and for Reynolds numbers between Re = 5x106 and Re = 14x106, with specific gravity for natural gas Sg=0,6. The flow efficiency factor E is defined as an experience factor and is usually assumed to be 0.92 for average operating conditions. The Panhandle friction factor is defined as: f = 0.0454 (d/qhSg)0.1461. In the range where Panhandle formula is applicable, the friction factors are smaller than one from Moody diagram as because of that the flow rate are usually greater than those calculated using equation for isothermal flow. Calculate pressure drop or flow rate in natural gas pipeline. Calculator applicable for natural gas lines over 1 bar. Volumetric flow rate qh in Renouard equation is to be used at standard conditions (p=101325 Pa, T=288,15 K (15OC)). Calculate heat energy - power generated from combustion of fuels. The value K in this equation is the total resistance coefficient of the pipe line, including entrance and exit losses when they exist, and losses due to valves and fittings. In above equation the pressure difference Δ p is the difference between inlet pressure and the pressure on the larger cross section. When compressible fluid is flowing into the atmosphere it is equal to gauge inlet pressure. When the pressure difference Δ p between inlet pressure and the larger cross section area pressure, or the atmosphere pressure, is higher than the value in the table below, for certain value of resistance factor K, the flow will be sonic on the exit or somewhere along the pipe and expansion factor Y will be as it is given in table bellow. For other values of pressure drop Δ p, tables bellow should be used for expansion factor Y determination based different values of resistance factor K. Note - all tables for expansion fact determination can be used for perfect gases. Under normal atmospheric conditions exists in the form of liquid. When the heat energy is added to the water the temperature of water rises and at certain temperature, depending in the value of pressure, boiling starts. If the heat energy is added after the boiling starts, the temperature of water will not rise until whole amount of water evaporates. This state is called saturated steam, as at the same time both state of water are existing - liquid and steam state. It may be wet or dry saturated steam. The dry saturated steam does not contain mechanically mixed liquid water particles, as wet does. So actually with heat being added to the water after the boiling starts, the wet saturated steam will change state into dry saturated steam, due to evaporation of liquid particles in the mixture of steam and liquid. If the heat energy is being added just after the whole water has evaporated and the steam is in the state of dry saturated steam, the temperature and pressure of steam will start to rise and this state is called superheated steam. Heat energy is the form of energy and unit for heat in metric system is the joule [J]. As it is very small unit, more often is used kilojoule [kJ] or even larger megajoule [MJ]. Energy per unit mass is the joule per kilogram [J/kg] or multiple of this unit like [kJ/kg] etc. 1 Btu/lb = 2.326 J/g = 2.326 kJ/kg.